All throughout your earthly life you will be guided, supported and protected by your own very special guide, your “Guardian Angel”. Connecting with this angel is a beautiful and enriching experience, one that allows you greater insight and focus on the divine purpose of your life. To be able to make this connection to your guardian angel your soul or spirit energy needs to be attuned to the infinite light and love available to each and every being. I originally learnt this meditation many years ago from the Reverend Carrie Ann St Clair, a wonderful teacher, international psychic, medium and friend, who has since passed on to the world of spirit. Over the years it has probably changed slightly but its essence remains unchanged. It is wonderful how the love, wisdom and teachings that we share with others lives on continuing to be a positive force in this earthly world long after we have left it. To enable you to take this journey effortlessly, without having the need to think about what happens next you may need to read the visualization below a few times or you may prefer to simply tape it so you can just play it back. Protection is extremely important when ever we are attempting to contact spirit. Even when connecting to a spirit as beautiful as your Guardian Angel, it is vital to put in place psychic protection (a barrier) to keep you safe. Our physical body, as you probably already know, is made up of energy, as is everything and the frequency at which our energy vibrates is much lower than that of Spirit. This means our energy is denser or heavier. If you look at the analogy to the lotus, as the Buddhists do, we are at the lowest level sunk down in the mud and as we grow spiritually we come up through the water into the air and light where we blossom, unfolding to become the pure, fully actualised being that we were always meant to be. Spirits are on a higher, less dense level. As they continue on their journey they also change energetically, their energy becomes increasingly finer, less dense and vibrates at increasingly higher frequencies. This places us closest in energy to Spirits that are still in the lower energy levels of life beyond this earthly plane. Spirits who are still in the process of working through their own issues. It is important to avoid contact with them for their benefit as well as our own and that is why this meditation begins by putting protection in place. There are various effective methods of protection that have been taught over the years. It is important to find one that genuinely works for you and your belief system. For some this may involve chanting, lighting incense or performing a set of specific rituals. Whichever practice you decide to use make sure you are well acquainted with it and that it is a well accepted, respected and a tried and proven one. As a Christian I protect myself by calling on the Archangel Michael to protect me and keep me safe. I ask that he allow only Spirit coming in the name of Our Lord Jesus Christ and from the light through to me. I then visualize white light encircling and filling the space I am in. I place myself in a bubble of bright white light and surround this with a fine gold mesh. Next I visualise a series of golden crosses. I place the first of these above the top of my head protecting my crown chakra. The second one I visualise below me, under my feet if I am sitting on a chair or below my base chakra (bottom of spine) if I am sitting on the floor. I then visualise another gold cross in front of me and then I visualise a gold cross on either side of me and finally a last gold cross behind me. Having done this I focus on my heart chakra, meditating on it until I am filled with love which I then send out to all sentient (feeling) beings. Finally I ground myself by visualising a deep root like that of a mighty tree growing, from the base of my spine if sitting on the ground or from my feet if sitting on a chair, down into the centre of the earth. Only then does my journey begin. 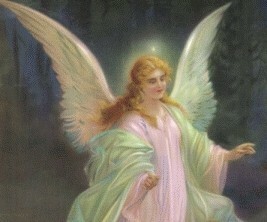 The Meditative Journey Towards Meeting Our Guardian Angel Begins. Immersed in a feeling of divine love, released of all earthly tensions, we begin to transcend all physical boundaries and find ourselves bathed in warm, pure, golden light. We feel ourselves being ever so gently drawn upwards into this light. Emerging before us we see a smooth pathway and we step onto it, following it as it gently winds its way towards the top of a small hill. On either side of the path a profusion of flowers in all the colours and hues of the rainbow, gently wave in the soft, warm breeze. We feel totally, blissfully at peace and on reaching the top of the hill we stop to drink in the beauty of the scene before us. The air is full of birdsong and we can hear the sound of a small babbling stream that is flowing through the valley below us. We wander on down towards the stream, feeling the soft, warm grass beneath our feet and the gentle breeze caressing our face. A short distance away we see a large smooth rock just near the edge of the steam. We go over and sit quietly down, drinking in the beauty that surrounds us. The rock is warm and as we sit gazing at the amazing colours dancing in the light around us we notice that as the light sparkles and bounces off the water of the stream a fine mist is forming. Coming through this mist we see an angelic being gradually taking form and moving slowly towards us. It crosses effortlessly over the stream and stands before us for a moment before joining us on our rock. We feel strong rays of love and total acceptance enfold us as we commune silently, blessed to be here with our very own guardian angel. Side by side, in the soft, warm, golden light, we are as one lost in this precious moment, suspended beyond time and place. We become more even more still, more peaceful, as deep in our heart a clear flame arises, grows and illumines our whole consciousness with a qualities of Gods divine peace, strength, courage, heavenly wisdom, joy and love. After a time, feeling our guardian angel slowly rising, we become aware that this special moment is drawing to an end and that soon we will have to leave this special place. Our guardian angel makes us aware that they have a special gift for us. As we receive it we thank them before slowly rising and turning to head back along the path that led us here. Our feet seem to float above the path as we journey back through the beautiful flowers and birdsong. The light seems even brighter than before and as we travel on we quicken our pace, anxious to return and explore the gift we were so lovingly given by our guardian angel, aware of its potential to give us greater insight into our life’s purpose and the unique role we are playing out during this earthly aspect of our journey. We feel ourselves being drawn down to sit once more in the safe, protected space which is just as it was when we left. We feel totally refreshed as we look around us and rest peacefully for a time before once more thanking our angel and beginning to slowly bring back our focus and attention to the physical space around us. We remember we have the precious gift and look forward to exploring it and its meaning more deeply in the days ahead. We rise slowly and drink a large glass of water before returning to other tasks. May this meditation aide you on your journey as it did me. May you and your journey be blessed. The beauty of crystals is breathtaking and uplifting, but crystals can do more for your energy than you may realize. Everything in this world (and the next), is made up of energy. Remember back in high school the teacher drawing three boxes on the blackboard? (showing my age here!). The first box had circles, closely touching, no room to move, this represented solid matter- wood, plastic, pencils, bricks etc. It also represented ice, the frozen state of water. The next box drawn had fewer circles drawn in it; the “particles” were able to move around each other. This was the representation of the liquid state. Water flowed because the particles were further apart and could move. The last box had only a few free floating particles and represented gas. Gas could be invisible and the particles having more energy, floated. It was less dense. The gas in the experiment that followed was air. You then took an ice cube (solid), added heat energy, turned it to water (liquid), added more heat energy and made air (gas). It was all so simple and remains true. Everything is made up of energy in various states including ourselves. We appear as a solid to the eye but we all know that like plants and other living things we are surrounded by an energy field that spreads beyond our visible self (our aura). The energy in our aura vibrates at a much higher frequency than that of our visible (solid) body. We are unable to see this high frequency energy (just as we are unable to see electricity) but it is there and we can certainly feel its effects. We find crystals in a solid state where like us they give off energy which cannot be seen by the naked eye but which can be felt in the environment surrounding them. The energy given off constantly is able to interact with our energy and subtly change us. One of their most beautiful and treasured features is their colour. When we see their colour what we are actually seeing is the wavelengths of light that are reflected rather than absorbed by the object. Clear crystals such as clear quartz take in and reflect out light without changing it. Other crystals, such as peridot, are nearly always the same colour because they have certain light absorbing particles (atoms) that are essential to their structure. Yet other crystals, such as amethyst, can come in a range of different colours and shades because they can have varying quantities of light-absorbing impurities built into their basic structure. Science proved long ago that colour can and does affect peoples moods. We may smile but when you think how advertising people use it you realize it has many potentials. Pink walls in restaurants to make you eat more, dull olive green on the new cigarette packs to make them less attractive and turn you off smoking etc) At least we know crystals will not have their own agenda and if we are drawn to the certain wavelength of light being given off by a crystal it will be beneficial to us. Some crystals are noted for their healing qualities. Amethyst is often recommended as it is associated with inner peace. It is believed that as it opens your connection between your spirit and the divine it helps to change negative energy into positive energy. If you are drawn to a particular crystal it may be that your body is sending a subtle message that it needs that energy, just as it is doing when we crave certain foods. Other crystals have traditionally been linked with other positive qualities and I have listed some of them at the end of this piece to allow you to explore for yourself the benefits, beyond their beauty, that they may hold for you. Some are traditionally associated with spiritual development, but again I stress what you are drawn to is usually what is best to fulfill your specific needs. We are all different!